Based on characters from the novels of Caroline Graham, Detective Chief Inspector Tom Barnaby and Detective Sergeant Ben Jones investigate murders in the not-so-sleepy or peaceful English villages of Midsomer County. The Dogleg Murders -- Golf is a deadly game for members of the swanky Whiteoaks Golf Club. The Black Book -- An art auction of a newly discovered painting by a famous local artist leads to murder. Secrets and Spies -- British spies and the Cold War may be at the heart of murder. The Glitch -- Cyclists versus fast cars and rich entrepreneurs lead to friction and murder. 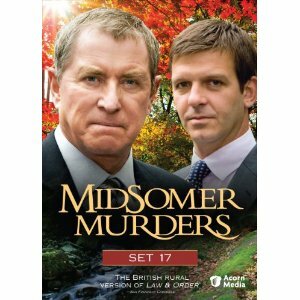 It's always a treat to join Barnaby, Jones, and the series regulars as crime after crime plagues the villages of Midsomer County, but the parade of famous (or at least familiar) actors and actresses (even in tiny roles) in each episode is half the fun!